There are a lot of parts and pieces to a fountain pen, and sometimes it’s confusing which parts are called what, especially if you’re newer to the hobby. Depending on who you’re talking to, there are different names for different parts, and it can be tough to try to troubleshoot when you’re calling parts different things to someone else! 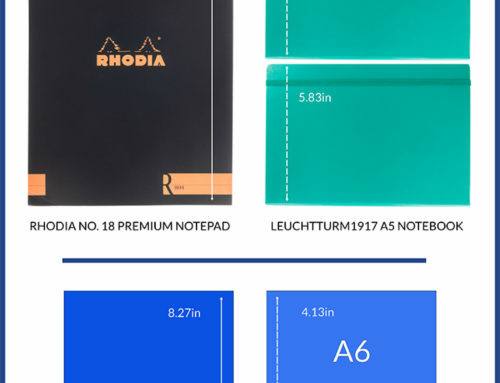 We’ve noticed this when trying to help our customers over phone or email, so we put together this infographic to show some of the most commonly talked-about pen parts. 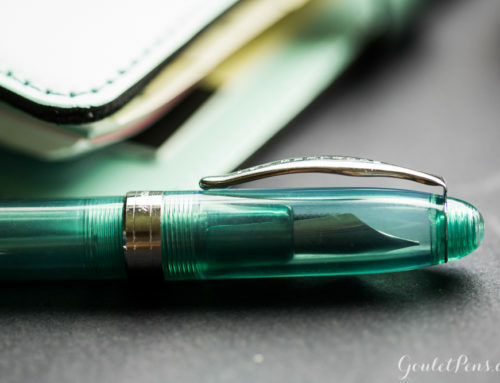 This pen is the Platinum 3776 (in Chartres Blue), which is a cartridge/converter pen that is a fairly representative of what you’d expect to see on most cartridge/converter pens. 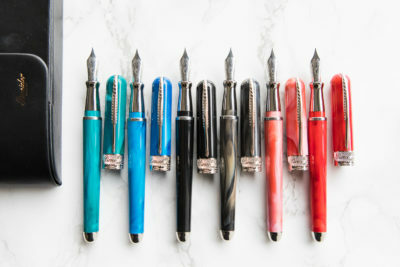 There are many parts that can have multiple names, and depending on the manufacturer/model of pen you’re handling, there might be different terms that are typically used. We’ve chosen the most common terms that we’ve used and heard others in the fountain pen community use. Hopefully this can help you out! 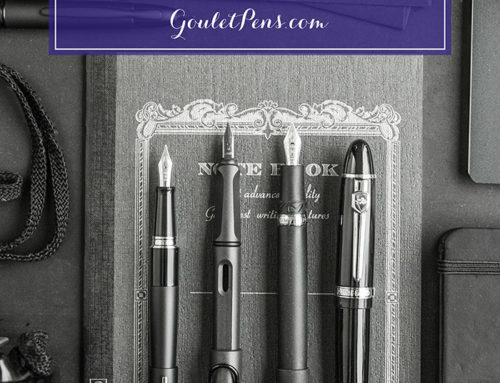 Cap: the part of a pen that covers the nib and attaches to the pen body. Finial: the top of the cap, sometimes decorated with the maker’s logo. Insert: the plastic liner on the inside of some pen caps that help seal the nib and keep it wet when capped. Centerband: the metal decorative ring that is usually placed near the bottom of the pen cap for decorative purposes, or perhaps to provide reinforcement to the cap threads. Lip: the open end of the cap, where the threads of the body fit to close the pen. Barrel: the long part of the main body of the pen which houses the ink reservoir. Threads: thin grooves cut into a pen to hold parts together, especially pen caps to the pen body. Step: the part of the barrel where the threads ‘step up’ to the body, which can matter when holding the pen. Body: the length of a pen barrel that typically houses the ink reservoir. Trim Ring: ornamental accents that serve an aesthetic purpose. 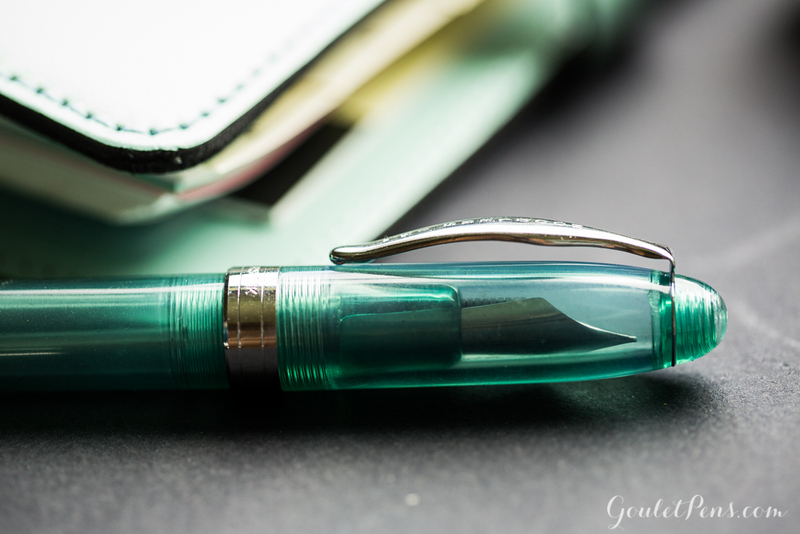 Nib: the metal tip of a fountain pen that actually touches the paper. Tipping Material: a small bit of hard-wearing metal (usually some sort of iridium alloy) that is welded to the end of a nib and ground to a specific intended size. Slit: the very thin cut running from the breather hole to the tip of the nib that carries the ink from the feed to the tip. Tines: the two front parts of the nib that taper to the tip. 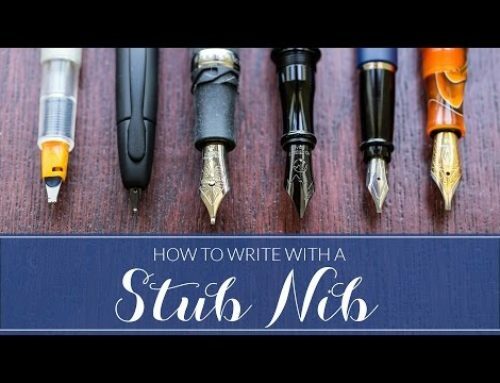 Shoulder: the widest part of a nib, where it starts to taper towards the tip. Breather Hole: a hole in the nib, at the end of the nib slit, that allows air to assist in the ink flow, also called a vent hole. 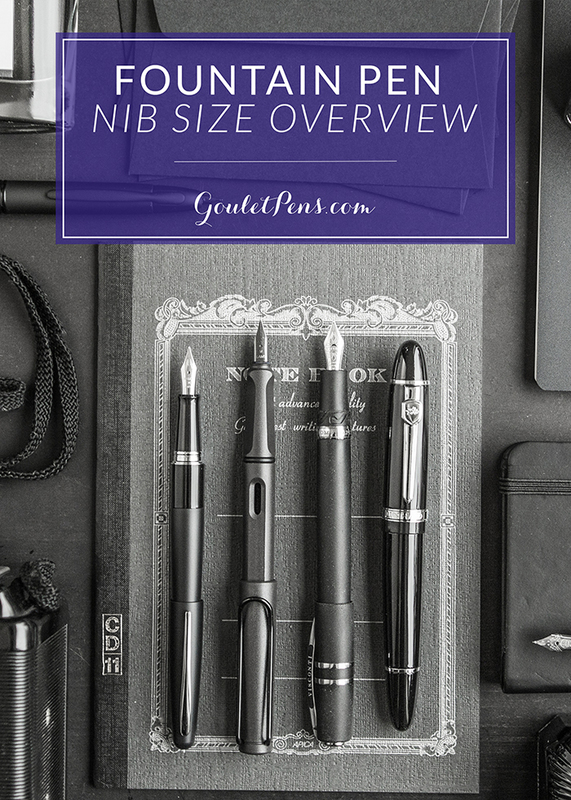 Imprint: the engraving or impression left on the face of the nib that shows the brand, model, or nib size. 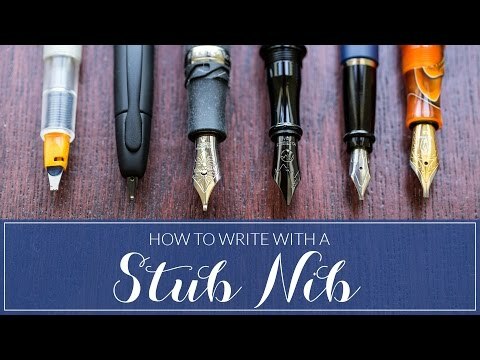 Body: the part of the nib that is typically imprinted. Base: the bottom end, or reverse end of the tip, where the nib fits into the section of a pen. Feed: the piece of plastic or ebonite (usually black) that hugs the back of the nib and acts as a vehicle for ink delivery from the reservoir to the nib. Wings: the widest part of the feed that matches up to the nib shoulder. Sometimes nibs will slide on and grab onto the feed wings. Fins: the small, thin pieces on the feed that allow ink to saturate into the air channels. 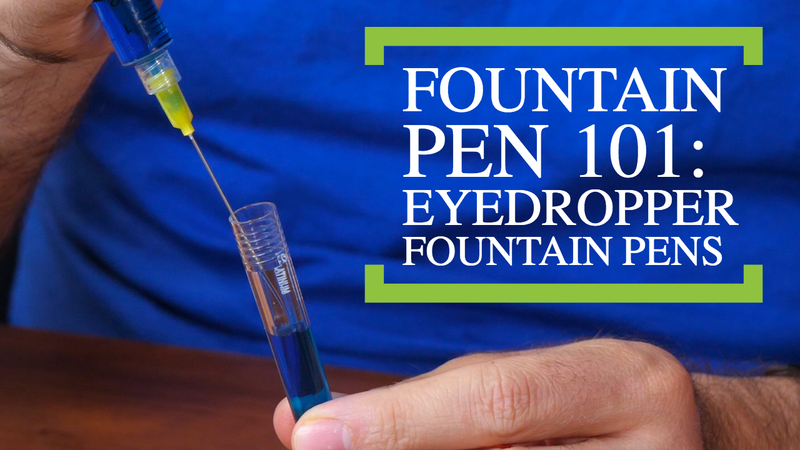 These act as an ink regulator for consistent flow when writing speed varies. Ink Channel: a very thin slit in the feed that hugs against the back of the nib and provides a route for the ink to travel through the feed. This is what helps to provide the necessary capillary action required for ink flow. Post: the back end of a feed that goes into the ink reservoir and feeds ink into the channel. Section: the part of the pen where the nib fits in and attaches to the pen barrel. Grip: the front of the section where you hold where the nib fits in, sometimes called just a ‘section’. Threads: thin grooves cut into a pen to hold parts together. Converter: a small filling mechanism (usually a screw-piston type) that fits onto a pen that also accepts a cartridge. This allows you to use any brand’s bottled ink instead of relying on limited proprietary ink cartidges. Mouth: the opening that fits onto the feed post to hold the converter in place. Ink Reservoir: a cavity inside a pen that holds ink. Seal: the ‘working’ part of the converter piston that creates a vacuum in order to draw ink into the reservoir. Rod: the threaded portion of the piston mechanism that causes the seal to move up and down when the knob is turned. Shroud: the metal covering that holds the piston mechanism onto the back of the ink reservoir. Knob: the part of the converter that you turn to move the piston seal up and down (and thus fill the converter). 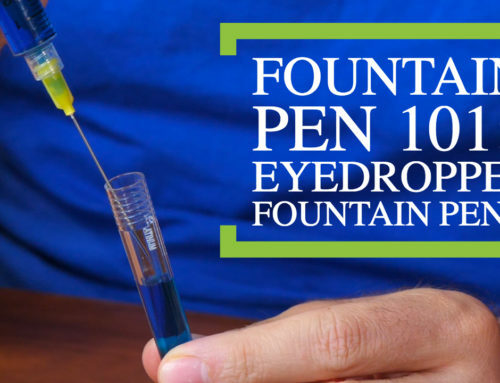 Be sure to check out more fountain pen terminology in our Glossary of Fountain Pen Terms, and ask for any clarification in the comments below! Be sure to share/link/Pin this graphic to your heart’s content, we created this to help educate the fountain pen community. Enjoy!